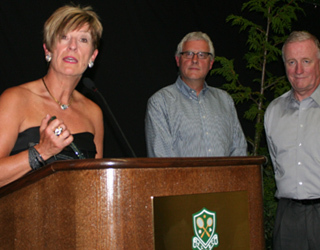 Above, Carol, Bill and Brian Pedlar accepting the plaque on their father's behalf, Jack Pedlar, who was introduced into the Canadian Tennis Hall of Fame by Robert Bettauer during Steve Stevens Senior National Championships banquet dinner on Thursday August 22 at the Vancouver Lawn Tennis Club. Jack was honored for his lifelong dedication to the sport of tennis in BC. He played a huge role in the development of tennis in BC by acting as a coordinator to build the relationship between the USTA and the Pacific Northwest, enabling many junior and senior players to compete in tournaments. Jack Pedlar played the sport until his passing in 2009. Photo 1 : Robert Bettauer, chair of Tennis Canada Hall of Fame Committee. Top-seeded Robert beat Art Hobbs, 7-5, 6-2, in all BC finals, to capture the Men's 55 Singles title. Photo 2: Cora Wills and her husband Charles Wills. Top-seeded Cora fell to Brenda Cameron, the eventual winner, 6-2, 6-0, in the Women's 55 Singles semis. Cora later teamed-up with Brenda to beat Patricia Babcock and Michelle Karis, 6-2, 6-3, to win the Women's 55 Doubles. Photo 3: Max Brown won the Men's 45 Singles title. Max played down in a younger age category and teamed-up with Olivier Borlee in the Men's 40 Doubles, where they lost in the final to Julien Heine and Joachim Nierfeld, 6-4, 6-3. Photo 4: Susie Fought reached the Women's 45 Singles final where she lost to the top-seeded Alison Taylor, 6-3, 6-3. Susie and her doubles partner, Tessa Ainge, outlasted Carol Lau and Anne Lydon, 6-3, 2-6, 6-1, to win the Women's 45 Doubles title. Photo 5: Keith Porter, left, and Mamood Gouneili. Top-seeded Keith reached the Men's 60 final in both singles and doubles. He lost in the singles to James Cameron, 6-1, 7-6, and in the doubles (with Dennis Ing) to James and his partner, Steve Yesowick, 6-4, 6-4. Photo 6: Eric Bojesen winner of the Men's 70 Singles and Doubles. Photo 7: Players enjoying good food and meeting new & old friends in the receptions hold in the Arbutus Club on August 19 and the Van Lawn on 22nd. Photo 8: Donald McCormick lost in the semis of the Men's 65 Singles to Joe Forray, 6-3, 6-2, but won the doubles with Robert Bardsley. They beat George Lea and John Wade in the final, 6-0, 6-2. Robert won the Men's 65 Singles. Photo 9: From left, Ronald Josephson, Pat Macken, Ken Mcbean and Warren Lore. Pat and his brother Tony Macken toped Murray Bennetto and Stephen Kimoff in the Men's 50 Doubles final, 6-3, 6-2. Ken, the king of Stanley Park, won the Men's 60 Singles Consolation by outplaying Roger Skillings, 6-4, 6-2. Photo 10: The Men's 65 top-seeded Ken Dahl had to pull out of tournament due to an unfortunate car accident just before the event. He is fine now. We hope Tennis Canada will let him go with the team to the World Event in September. Photo 11: Luke O'Loughlin, left, and Curtis Brennan. Remember Luke? He was Tennis BC, Director of High Performance for many years. Luke coaches at Hollyburn Country Club these days. Men's 65 Singles Bob Bardsley Joe Forrayi 6-4, 7-5.